Bigger Powermix Pro diet feeders from Shelbourne Reynolds include this 30cu m twin auger machine. 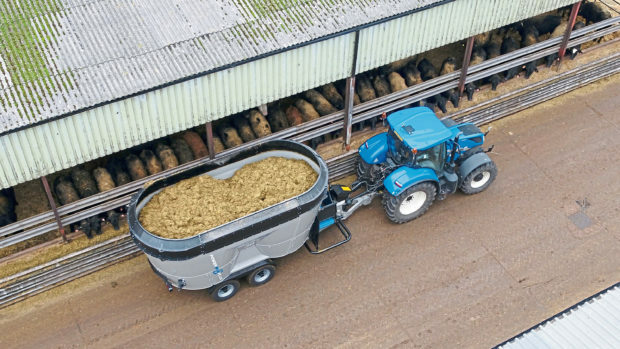 The 12cu m tub-style machine has a modest pto power requirement of 60hp, says Scottish territory manager Allan Watt and the standard single discharge door can be swapped for a two-door arrangement for dead-end feed passages. Like its twin and triple auger siblings in the range, the newcomer has stepped rather than smooth mixing auger flights, which are said to create added movement within the ration, resulting in a complete mix being created more quickly. The reduction in mixing time results in less fuel and lower tractor hours and a consequent cut in operating costs, suggests Strautmann. As standard, the Verti-Mix 1201 is equipped with an enclosed hay ring, hydraulic control and a simple Digi-Star EZ2500 accumulator weighing system. Meanwhile, UK manufacturer Shelbourne Reynolds Engineering (SRE) is looking to larger herds for sales of 24cu m and 30cu m additions to the Powermix Pro diet feeder range, which currently peaks at 25cu m capacity. “With many farms increasing their herd size around existing buildings, Powermix Plus machines have been designed to offer higher capacities and swifter processing and feed-out times without greatly-increased dimensions,” said Neil Smith of SRE. The 24cu m model is only 3m tall and 2.8m wide at the top of the tub. For farms mixing up to 150 tonnes a day, the twin vertical auger newcomers have been beefed up in a number of areas, including the axles, gearbox, tub structure and feed-out conveyor. A new feature is the bolted-in steel liner that SRE claims can be replaced relatively quickly on-farm when worn. Selecting the three-speed drive to the mixing augers, which are 2,800mm across at their widest point, is handled by a wireless control system and there is a new 800mm wide webbing conveyor at the front to handle discharge from a larger door for faster feed-out, especially when dispensing fresh grass in a zero grazing system. Lastly, feeder maker Trioliet is going bigger still with its new triple-auger Solomix machines – capacities are 27, 30 and 34cu m for large herds and also to suit producers with more than 180 cows who prefer to feed the entire herd with just one or two mixes to minimise labour demand. The Solomix 3 New Edition feeders are described as low profile machines that can be filled by a relatively smaller loader and are capable of being operated by a 140-160hp tractor.